Once I paid attention, though, I realized that there were two things kind of funny about this way of hearing it. One was that the bass line was exactly the same throughout the whole song, but was shifted by half a bar when you compared the verse and the chorus. The other was that there was a half-bar hitch both going into and coming out of the chorus. But this really isn’t the way I want to hear the chorus! I can hear it this way if I have to, but it feels artificial, like in reality the band has shifted the beat and I’m just hearing it this way for intellectual reasons. So how did the band hear it? Did they really hear the chorus the second way and were playing in 4/4 the whole way through, or did they hear the downbeat shift and thought that it was cool that the bass line went in and out of phase throughout the song? For decades I’ve wondered what the “correct” way to hear it is. 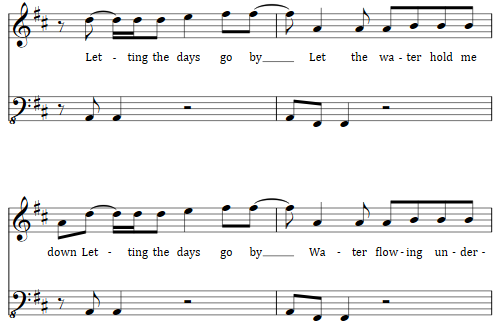 The song as originally conceived by the band is in 4/4 throughout with a consistent bass groove, as in the second version of the chorus above. At this point it’s probably very natural to hear it that way. 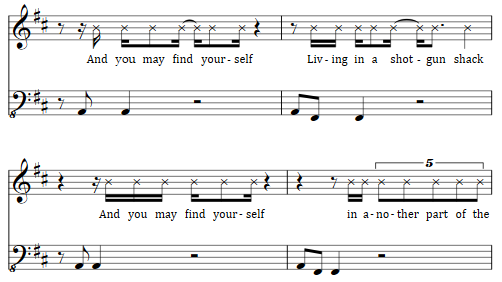 However, Eno hears it in the other way, with the chorus displaced by two beats, and starts pushing the arrangement in a direction that emphasizes that hearing. We end up with a rabbit-duck situation that has been specifically engineered to be confusing, and which was based explicitly on the producer’s confusion. In conclusion, Eno is a genius, but we already knew that. I recently went on a James Bond binge and watched all the canonical movies, ranking the theme songs as I went. Ethan Iverson graciously offered to host the resulting piece on his super usually-jazz-but-always-interesting blog Do The Math. One of the more entertaining categories of popular music of the last 50 years is the James Bond movie theme. Having recently watched all of the canonical EON/Broccoli Bond movies, I can assert that sometimes the four minutes of opening credits is the high point of the entire film. As with any art form, my first instinct when encountering these specimens was to rank them. Despite the wide variety of style to be found in these songs, there’s a lot of commonality too. Usually there’s a sense of danger, demonstrated by minor keys, chromaticism, or menacing orchestration. There’s often a pinch of swagger as well, though, communicating how Bond can confidently overcome any crisis no matter how dire. Of course the music also often projects sexuality; at its best this coexists with the dangerous vibe, though there is a sub-tradition of straight-up ballads. Often the main Bond theme is quoted, a tradition I found charming at first though it quickly wore on me. Continued at Do The Math. I’ve had a little more time now to study the structure of this piece. And here are what I could make of the harmonies of the solo sections. These were deduced by looking at both the actual comping performed during the solos and the source material that the solo structure comes from. There are some discrepancies, which is to be expected, although a few them turned out to be transcription errors, which is a good sign (for the model). 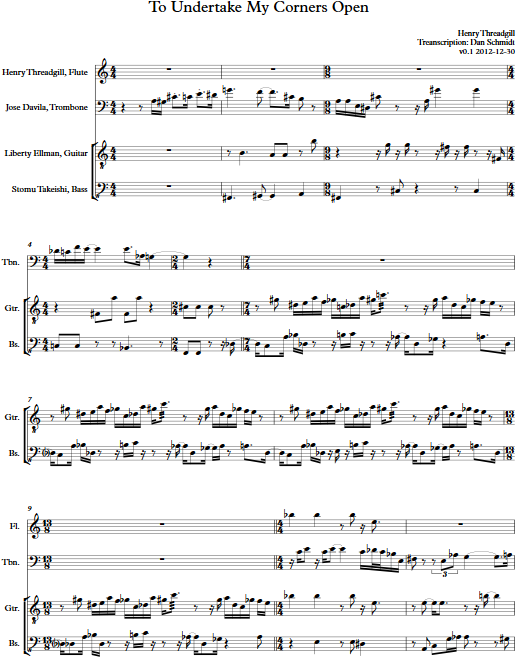 Interestingly, I didn’t notice any regular correspondence between parts for the flute and trombone. Look for any rules governing the harmonic skeleton. For example, there often seem to be common intervals between one “chord” and the next. Look for rules governing the flute and trombone solos; they seem to be much freer than the guitar solo. See if I can find any way that the flute and trombone parts in the through-composed material (such as the head and coda) are reused or referred to. Currently only the guitar and bass parts seem to be structurally interesting. Try to discover the function, if any, of the sections that I haven’t linked to any other sections yet, for example the coda intro measure (m. 192) and ending tag (mm. 214–217). One of my favorite tournaments at the Boylston Chess Club is the annual Herb Healy Open House held every New Year’s Day. You get to socialize and play four relatively quick (G/40) games of chess, and there’s an unrated section if you stayed up too late the night before. This year I played in the unrated section as usual and had four interesting games. Let’s take a look! In the first round, my opponent and I both fumbled around through a weird opening move order until we ended up in a King’s Indian sideline that neither of was familiar with. I think that this position illustrates a frequent 2000 vs 1600 phenomenon. As White I haven’t done anything super tricky yet, but all my pieces are developed and ready to take action in the future. 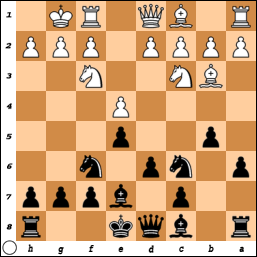 Black’s pieces are scattered all over the place; his queen and bishop haven’t moved yet and his knight on a6 isn’t much better. One of the things I feel I’ve gotten much better at in the last couple of years is just putting my pieces on good squares and seeing what opportunities present themselves instead of constantly pressing and trying to make things happen before I’m fully developed. Black tried to get a little more developed with 11…Bd7? but this takes a retreat square away from the knight on f6 and leaves the bishop in a spot with two possible attackers and only one defender. After 12.e5! 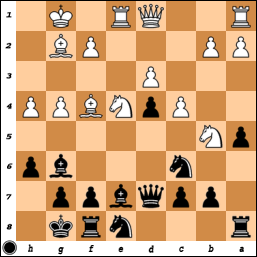 Black’s only reasonable move is 12…Nh5 but that’s clearly not what he wants to be doing in this position. After 12…Ng4? 13.Bf4! there was no way to avoid losing a piece to the upcoming h3. He resigned a few moves later. 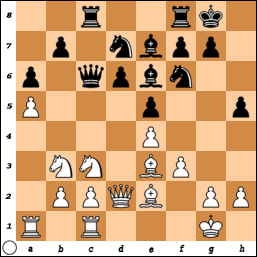 White’s been making me rather unhappy with threats against my d4, c7, and b7 pawns all game. Searching for a way to untangle myself, I looked in desperation at 17…Nd8! and was surprisingly pleased with what I saw. 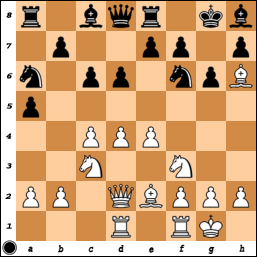 Moving the knight frees me to play …c6, blunting the effect of White’s light-squared bishop, removing a target from c7, and forcing White’s b5 knight back. I also protect the b7 pawn in the meantime so White doesn’t have any tricky discovered attacks against it. Despite all those pieces on the back rank, I finally felt really good about my position and expected to bounce back off the ropes with great force. White went all in with 18.h5 Bh7 19.Be5, attacking the d4 pawn, but I hadn’t thought this would work. After 19…Ne6 20.f4 f6 (my point; the bishop is trapped) 21.f5 fxe5 22.fxe6 Qxe6, I was already pleased with my extra pawn when White suddenly played 23.Ng5!? Yikes! After 23…hxg5 White pins and wins my queen with 24.Bd5. For a while I thought I was in big trouble; if 23…Qf6 24.Bd5+ Kh8+ 25.Nf7+ Rxf7 White has 26.Rf1, which looked like it would win the exchange once I moved my queen. But then I realized I could just take on f1 with with 26…Qxf1+ 27.Qxf1 Rxf1+ 28.Rxf1 and I’m still a piece up. Gratefully, I played 23…Qf6 and White bailed out with 24.Nxh7, but after the intermediate 24…Qf2+ White’s king was in trouble. 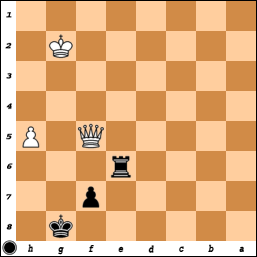 In the ensuing complications I picked up a piece and exchanged down to an easily winning endgame. Black is about to get …d5 in with the help of his queen, and then he’ll already have accomplished everything he could have hoped for from the opening. After the game, Mika said that he thought that my earlier a5 was a big mistake because now I can’t push the queen away with Na5. What am I supposed to do, take the rook that I just moved from f1 to c1 and put it back on d1? Yes, I am! After 15.Rd1! 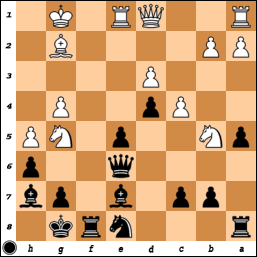 Black’s queen doesn’t have much point on c6, so the tempo loss isn’t a big deal. I can bring my a1 rook over to c1 and everything’s nice and tidy. This has been played 4 times in my database (out of 6 games) and White did fine, winning two games and drawing two. It can be really hard in chess to look at a position with fresh eyes and be willing to basically undo your last move, and I was not up to the challenge here. 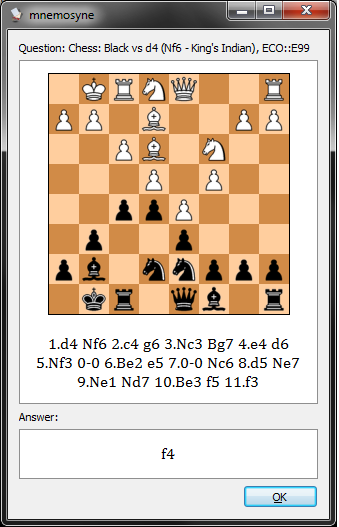 I played 15.Na4? and after 15…d5 Black was already better, and although I put up a decent fight, I lost in 30 moves. White played 8.d4? Nxd4! 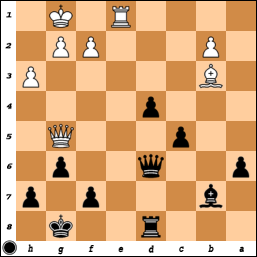 9.Nxd4 exd4 and now he can’t play 10.Qxd4 because after 10…c5 and the queen moves, Black plays …c4 and traps the bishop. Probably the easiest way to keep everything under control here is 29…Rd7, protecting against Re7. Instead I immediately tried to trade pieces with 29…Bd5?, and after 30.Bxd5 Qxd5 Tim bashed out 31.Re8+! Argh, it’s the infamous hook and ladder trick, winning my queen for a rook! After a minute of staring disbelievingly at the board, trying to decide whether to resign, I played on with 31…Rxe8, because hey, at least there’s not a lot of time left on our clocks, so the duration of my misery is limited. Besides, I remembered a fortress pattern from one of the Yusupov books and it seemed possible that I might be able to set it up, especially since Tim only had one minute and probably didn’t know what I was aiming for. I wasn’t 100% sure at the time, but according to the tablebases, this is in fact a theoretical draw. I played 51…Kg7 and from that point I can just shuffle my king between g7 and h7 and my rook between e6 and h6 as the situation warrants, and White can’t make progress. It’s very important that my pawn isn’t any further up the board, or there would be room for White’s queen to sneak around from behind. On move 72, with 7 seconds left on his clock, Tim finally gave up and agreed to a draw. I was upset that I turned a win into a loss, but on the other hand I kept fighting and turned the loss back into a draw with the aid of some endgame knowledge that a lot of masters don’t know, so I could be pleased with that. And the spectators enjoyed it! Over a year ago I started transcribing Henry Threadgill’s “To Undertake My Corners Open”. I got to the 90% point a long time ago, but as with many projects, it’s the last 10% that takes the most calendar time. One thing that slowed me down is that Threadgill’s flute is super sharp, especially in the high registers, approaching 50 cents by the end of the piece, playing havoc with my ability to match pitches as well as my motivation. I finally got out of that rut when I realized that he was consistently sharp and not just all over the place from one phrase to the next. Once again I could never have finished this project without the great software Transcribe!. Each of the solo section has a different harmonic cycle. The trombone has 3 cycles of 95 beats, the guitar has 8 cycles of 22 beats, and the flute has 2 cycles of 96 beats. As far as I can tell they’re all completely independent. The structure of each cycle definitely includes chords, or at least pitch collections, not just bass notes. They vary a bit each time around but in general the “changes” for each cycle are pretty consistent. Just as the trombone cycle (mm. 18—41) is the head (mm. 1—15) slowed down,, the guitar cycle (mm. 90—95) is the little bit between the recap and coda (mm. 183—191) slowed down, and the flute cycle (mm. 130—150) is the coda (mm. 193—217) slowed down. I was particularly happy to discover this last one, since I was having trouble making sense of the coda before; I couldn’t even figure out how to bar it. If it seems a little over-barred now, it’s because I matched it to the meters of the flute cycle, and the rhythms don’t make any less sense than they would with any other barring. Maybe it’s just me, but I feel like the cycles get further out harmonically as the piece progresses. The trombone solo feels very tonal in a lot of places, the guitar solo is a bit less consonant, and the flute solo feels really abstract (although perhaps the fact that he is 40 cents sharp doesn’t help). Write out the “harmonies” of each cycle. See how those harmonies compare to their “source material”. Look for more rules about how the melodies and harmonies are constructed. Compare to other recorded performances of the same piece to see how much is kept consistent. 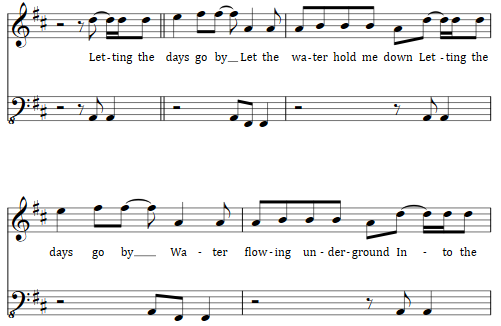 For example, I assume that the entire coda is through-composed, but perhaps there’s some room for variation there. All thoughts on the analysis and/or suggestions on the transcription itself are welcome. Mnemosyne is a spaced repetition program for aiding memorization; see my first and second posts for more information on the program and how I use it. I guess it is high time for another update; when digging out the above posts I was startled to see that they’re from four years ago. I’ll mostly discuss my experience using it for chess, since that’s what the majority of my 8000 cards are. I’ll skip to the exciting conclusion first: since starting to use Mnemosyne for chess knowledge, my USCF rating has risen from a pretty stable 1800 over fifteen years of on-and-off playing to over 2000. That may not look that impressive, but the chess rating system is effectively logarithmic; the difference of 200 points means that new me would score about 75% against old me, so that’s a pretty big jump, especially for a middle-aged person with a previously stable rating like me. Of course, correlation does not imply causation, and there’s always a bunch of noise involved in chess results, but I’ve now played enough games in a row (around 60) with a performance rating of over 2000 that I feel comfortable assuming that I have actually improved. Sometimes the answer includes some explanatory text to help me remember why the move is good. Most obviously, I have internalized thousands of good opening moves, so I am less likely to make bad moves in the opening, or spend lots of time figuring out good moves on the fly. I am often able to gain time on my opponents in the opening, as they are “out of book” and thinking on their own before I am. Even if they find good moves, they use up valuable time on them. I am now able to play very sharp (tactical and tricky) openings because I’m confident that I can navigate their waters. This allows me to play much more interesting and dynamic chess than I previously felt capable of doing. There are drawbacks as well: my memory can fail me in a complicated line, or my memorization can run out too early in a tricky position if I was careless entering the line, or I can enter a position by rote that I haven’t spent much time thinking about strategically and have to wing it. But overall it is a clear benefit. It’s hard for me to assess how these cards have affected my play. I don’t think I can recall any particular situation in a tournament game in which I consciously remembered a particular card (even an endgame one), prompting me to notice a specific good move that was otherwise eluding me. But they certainly haven’t hurt, and the effect I was hoping for was more of a subconscious one anyway, and as I said my rating has gone up along with this regimen, so I’m continuing to proceed with the assumption that they’re helping my play. How much time does this all take? On any given day I have to review about 60 to 100 cards, which takes me probably between 10 and 30 minutes (opening positions can take a while, since when a card comes up I first play through the variation on a virtual chessboard), though I usually don’t review them all at once. Making cards can be a little tedious (I don’t want to do the calculation to figure out how much time I’ve spent making all 8000! ), but it seems a small price to pay to prevent the knowledge I’ve just acquired from leaking out. The other topic that spaced repetition has been the most useful for is math. I enjoy reading math and physics textbooks but my retention is poor, so I’m constantly starting over. This causes even more problems because I already half-know the early material in the book, so I skim it, which means that once again I’m not really internalizing it. Memorizing formulas and concepts means that I don’t have to start from square one every time. Esperanto vocabulary: I still haven’t picked this back up since the last time I mentioned it, but it’s nice to know that because I review a few cards a day, it’s still in shape if I ever pick it back up. Go problems and joseki: I’m not sure how much this has really helped me, since I haven’t played Go very actively in the last few years, but it’ll be interesting to see if I have less rust than usual the next time I pick up the game. Japanese hiragana and katakana: I clearly still haven’t still internalized these, since once I do well enough on one of them that I go a few months without seeing it again, I tend to forget it the next time. I’m sure this is due to the fact that I’m not doing anything with this knowledge, so I never have any context other than the flashcards. Cyrillic: so I can read proper nouns on Russian chess websites. Definitely a success. Keyboard shortcuts for Sibelius (music scoring program): mixed success. A lot of shortcuts are very abstract like Ctrl-Shift-Down, so they’re pretty hard to memorize. I think I need to learn these more with my fingers than with my eyes and brain. Overall, using spaced repetition has been a tremendous benefit to me. To take the chess example: even if I hadn’t seemed to have improved as a result, knowing that all the studying I do is not just pouring water into a leaky bucket (as it seemed to be for the previous 15 years), but instead is permanent in some sense, has made me immensely more motivated to learn. The same is true for other subjects like math. If any of the above discussion makes you jealous, I highly recommend you give it a try. This is a book about music cognition: attempting to understand how people understand the music they hear. Temperley’s main thesis throughout the book is that a profitable way to study music perception is to pretend that the listener is doing a Bayesian analysis to determine the structure (e.g., time signature and key) behind the musical surface (the audio signal being heard). Bayes’ Theorem seems to be pretty hot these days. It’s a statement about probabilities, the main point of which is that the a priori likelihood of certain states is useful information when trying to figure out what state actually exists. A standard example is that if a certain disease is incredibly rare, then even if you test positive for it with an only slightly fallible test, it’s still quite unlikely that you really have it. The whole idea that musical perception is largely about creating models in your head about what’s going on, with associated expectations about the future that can either be met or thwarted, and that composers are constantly playing with those expectations, is associated in my mind with the late Leonard Meyer, who is definitely worth reading. I recommend in particular Emotion and Meaning in Music. Temperley uses Bayesian analysis to simulate how listeners create a presumptive model for a given musical signal; for example, if a note arrives a little later than expected, the listener has to make an on-the-fly guess whether that is due to a syncopation (the tempo remains constant and the note is offset from its expected location relative to it) or rubato (the tempo has slowed down slightly and the note is exactly where you’d expect in the slowed-down tempo). If you have a model for the relative probability of the two cases, you have good grounds for guessing which is actually going on. (Note that the model can change according to what kind of music you’re listening to: the answer to the above question is much more likely to be rubato if it’s a classical performance and syncopation if it’s a rock performance). Temperley creates these sorts of models to generate proposed probability distributions in varied domains, from time signatures to key determination to modulation detection. There are some good standard corpora of analyzed musical examples so he’s able to evaluate his models to existing ones fairly accurately, and they perform well though not groundbreakingly so. One nice thing is that the models tend to be fairly simple compared to many other ones in the field, which tend to be rather special-cased and apparently a bit fragile. Even though there’s no silver bullet here, the ideas in it are quite interesting. I particularly like that the models end up being fairly straightforward and don’t require a ton of specialized tweaks, which is a promising feature. The math involved is real, but if all you care about is the music you can probably gloss over most of it if you trust the author. Worth reading if you’re interested in how people perceive music, either for its own sake or because you want to exploit it as a composer or performer. Henry Threadgill’s Zooid group has made some really interesting recent music in an original musical language, but I’ve seen very little discussion of what the language is, and Threadgill himself doesn’t seem to be very forthcoming. The best description I’ve found comes from guitarist Liberty Ellman in a phone conversation with Nate Chinen, but there’s still not enough detail for me to reverse-engineer it. A diagram would probably clear it all up, but it’s hard to provide a diagram over the phone! 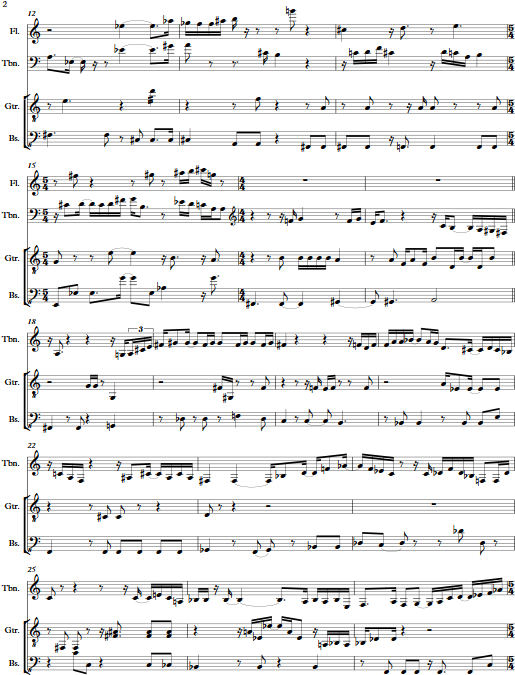 So I started transcribing a piece to see if I could start to make some sense of it. I chose “To Undertake My Corners Open” (YouTube link) from This Brings Us To, volume 1. It’s pretty gnarly stuff, so I’m pausing a couple of minutes in to report my findings so far. If I waited until I finished the whole thing, it would be a really long time before I wrote anything, plus I would have a novel’s worth of things to say about it; this way I can write as I go, and maybe even get some feedback. I’ve transcribed the “head” as well as the first “chorus” of the trombone solo (his solo lasts just under three cycles of a repeating bass progression). The score so far is below but it’s probably handier to look at the PDF. Caveats: I have a pretty good ear, but this stuff is hard! It’s not particularly tonal and there are two “analog-pitch” instruments (trombone and bass). Meanwhile the guitar has nice discrete pitches but is hard to hear behind the other instruments. The beat can be hard to identify; Threadgill tends to deliberately avoid obvious downbeats, aiming for a more homogenous pulse. I tried to switch meter only when I really had to. I should mention that I use the fabulous Transcribe! program, and there’s no way I could have gotten remotely close to this amount of detail without it. Does the opening phrase of the trombone remind any one else of the beginning of Berg’s Lyric Suite? Probably a coincidence, but I get the impression that Threadgill knows twelve-tone history. 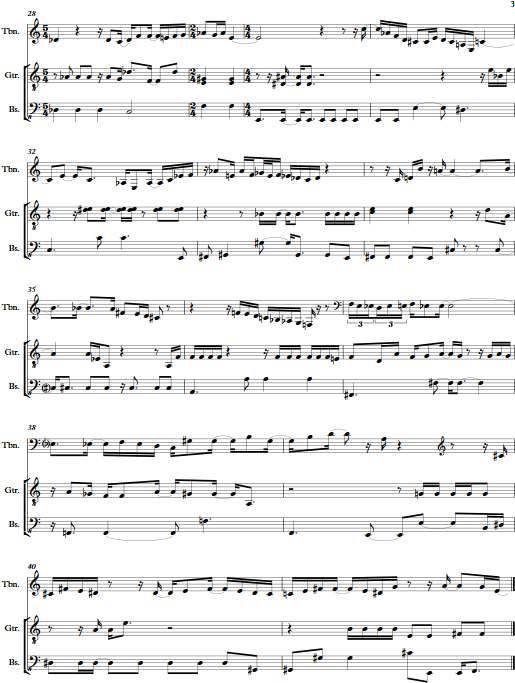 I’ll come back to the head, which seems pretty through-composed, in a minute, but moving ahead to the trombone solo (the bass cycle starts at m. 18): one thing that surprised me when transcribing is that it’s a lot more normal than it sounds at first. The trombone is following the bass progression very faithfully, and even navigates it in a quite tonal manner, measures 21-27 being the clearest example. It’s mostly the guitar that colors the harmonies in an interesting and dissonant way. The thing I’m most interested to find out next is whether the guitar part’s structure is more vertical (choosing notes each measure from a harmony relative to the bass) or horizontal (charting an independent path that creates interesting harmonies by chance). Ellman’s comments give the impression that it might be the latter. Once I finish the next two choruses of this solo, I’ll have a better impression of what is consistent each time around, which will help illuminate the structure behind it. I said I would get back to the head later, and here’s why: the structure of the head is basically exactly the same but twice as fast! Even the lead-in, not pictured above, corresponds: m. 2 is mm. 16-17 at double speed. The intro goes through one of the two G♭-D♭-C-B♭-F cycles, skips the second one, takes a weird repeated 7/4 break that could be related to the 5/4 D♭-C measure, then meets up again with the E and corresponds perfectly the rest of the way. That’s the most interesting tidbit I’ve found so far, and something I never would have noticed without writing it all out. Note by the way that the repeated guitar figure in that 7/4 section is almost palindromic. What’s the structure behind the guitar lines underneath the trombone solo? Whatever it is, it seems to be changing at about the same rate as the bass progression. Are there any particular harmonic or melodic rules behind the through-composed head? Nothing has leaped out at me so far, but I haven’t looked very hard.